Ferrari unveils F12-replacing 812 Superfast. 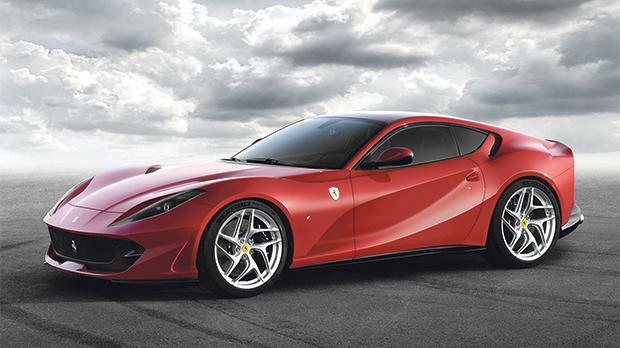 Ferrari has revealed its replacement for the F12 grand tourer ahead of the Geneva Motor Show next month. The 812 Superfast will get an updated aesthetic, as well as a new 6.5-litre V12 with 789bhp, permitting a 0-60mph time of 2.7 seconds and a top speed in excess of 211mph. This is aided by the new dual-clutch automatic transmission, which has specific gear ratios and quicker gear changes to match the car’s sharpened throttle response. As well as providing vast quantities of power, Ferrari also says the car offers “unparalleled handling and road-holding”. It is the first Ferrari to get electric power steering, which integrates all the car’s electronic driver aids, including the latest version of Ferrari’s side slip control system. In addition, the car is fitted with rear-wheel steering to improve agility, while the bodywork has been specially styled with aerodynamics in mind. At the front, the 812 gets active flaps on the underbody, while the rear flanks are adorned with an aerodynamic by-pass to increase downforce. 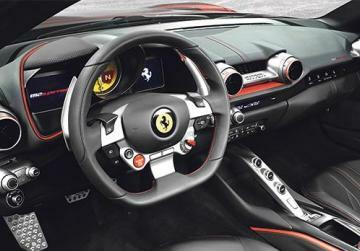 Ferrari claims the cabin is sportier than before, with a flat, horizontal architecture and new sports seats. There’s also a new steering wheel and instrument cluster, as well as the latest air conditioning and infotainment systems.